Knowfox is based on Laravel, the PHP framework for artesans. Aside from being a system for personal knowledge management, Knowfox is also an opensource system that can be used as a toolbox for your own projects. 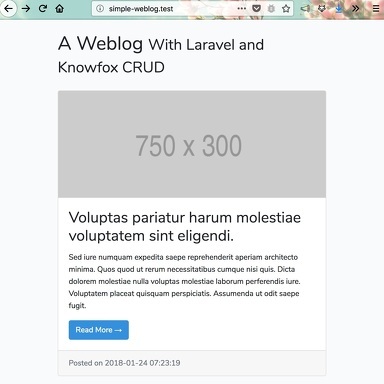 In this article, I will explain how to use Laravel, some opensource components and the Knowfox CRUD package to setup a simple weblog. Before getting started, you might need to install Composer, the PHP package manager, first. Just follow the instructions on its website. Then, open http://localhost:8000 in your favorite browser. You might need to install sqlite3 before using it, e.g. with brew install sqlite3. You can also use SQlite Browser to manipulate your database, if you prefer a visual tool. Delete all other lines with DB_... that the file may contain. 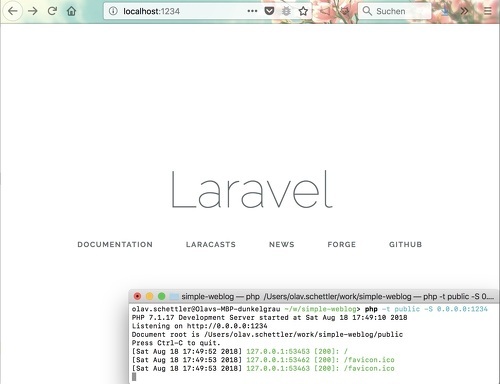 This concludes the Laravel installation, complete with authentication and Bootstrap 4 templates. As you can see, the --all parameter does a whole lot for you: It creates the model alright, but it also creates a factory, a migration, and a controller. We come to all of them in turn. This is the bare minimum of fields for our weblog. We make no attempt at multi-user permissions, so there is no owner field. This will create 50 random posts. Time to display them. 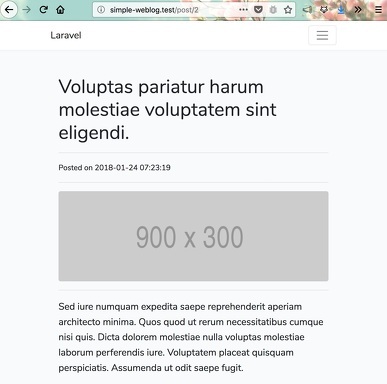 To make things easy for us, we use largely unstyled blog templates, based on Bootstrap 4, released by Blackrock Digital LLC under an MIT license. You can download the complete version from the Github repository for this article. As opposed to complete admin generators, the Knowfox CRUD package requires some orchestration to make it work. This makes it more flexible while keeping it simple. The package comes with its own settings table. Install it by running migrations: php artisan migrate. This prepares the admin list for our posts. It tells CRUD the name of our model class, the routing name and title of it, and the sort order of the index table. It also lists the columns to be shown on the overview page (ID and Title). Here, our two frontend routes at the bottom are still accessible by anonymous users. Our admin routes, on the other hand, are protected by Laravel's authentication system. * Frontend listing of posts. * Frontend view of post. * Admin listing of posts. 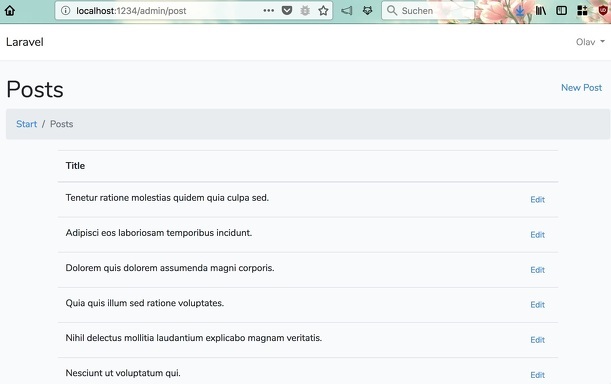 In addition to the two frontend actions home and show, there is an ìndex action which serves the admin list of posts. When you click on the edit links, you see only a blank page. We will fix this in the next section. 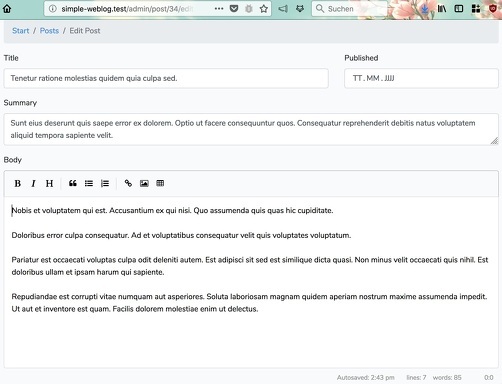 * Show the form for creating a new post. Also, add the line use Illuminate\Support\Facades\Auth; to the top of the file. 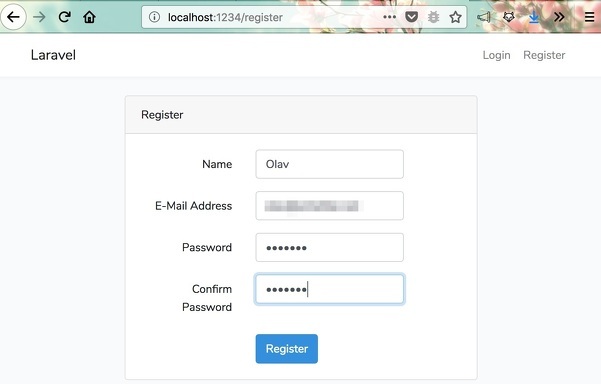 * Save the form data creating a new post. * Save the form data editing a post. Also, add the line use App\Http\Requests\PostRequest; to the top of the file. This completes the admin interface for our weblog. You can download the complete example code in the Github repository. All of this is not difficult to add. However, a tutorial needs to wait until another episode. I am very interested in your feedback or comments. You can add them on Github,using issues.